There are two main approaches towards the phenotypic analysis of frequency dependent natural selection. First, there is the approach of evolutionary game theory, which was introduced in 1973 by John Maynard Smith and George R. Price. In this theory, the dynamical process of natural selection is not modeled explicitly. Instead, the selective forces acting within a population are represented by a fitness function, which is then analysed according to the concept of an evolutionarily stable strategy or ESS. Later on, the static approach of evolutionary game theory has been complemented by a dynamic stability analysis of the replicator equations. Introduced by Peter D. Taylor and Leo B. Jonker in 1978, these equations specify a class of dynamical systems, which provide a simple dynamic description of a selection process. Usually, the investigation of the replicator dynamics centers around a stability analysis of their stationary solutions. Although evolutionary stability and dynamic stability both intend to characterize the long-term outcome of frequency dependent selection, these concepts differ considerably in the 'philosophies' on which they are based. It is therefore not too surprising that they often lead to quite different evolutionary predictions (see, e. g. , Weissing 1983). The present paper intends to illustrate the incongruities between the two approaches towards a phenotypic theory of natural selection. 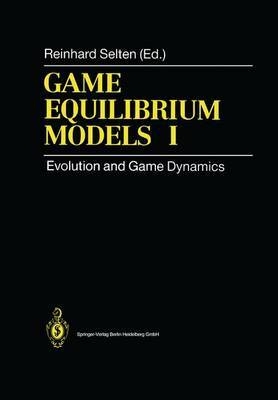 A detailed game theoretical and dynamical analysis is given for a generic class of evolutionary normal form games.